When I first started doing some serious travel to Melbourne for the big events, like the Melbourne Cup, one of the restaurants I had to try was Flower Drum. There is an awe to dining here for the first time; an intangible in the institutional surrounds that gives your experience an entirely different air. Like a drop of perfume, the feeling from Flower Drum wafts lightly through Lau’s Family Kitchen. It is seen with the flourishes of silver service, the multiple greetings and goodbyes, and the positive response to each and every request. It may be an unfair adjective to describe the cooking as “clean” but there is a purity in the flavours, and the fashion by which the kitchen expresses complex technique in simple presentation and fewer components on the plate, is superior to most Cantonese restaurants I’ve eaten in. Today, on my first visit for years, and Catherine’s first ever, we had a light lunch but the two dishes we shared highlighted where Lau’s is better than most. 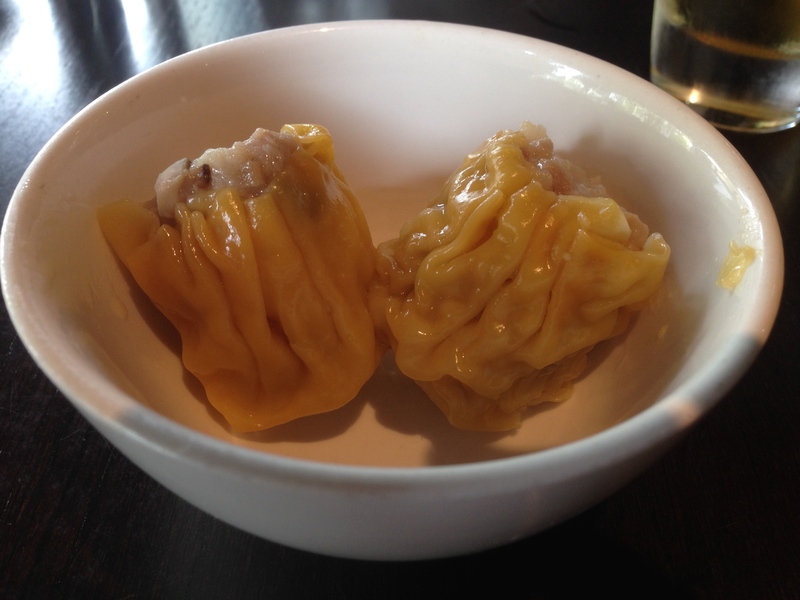 The first subtle, but distinct, higher quality feature, was the wrapper on the pork siu mai. Dumplings are great, in that even average dumplings are still normally comforting and satisfying. But like many simple things in life, you can easily detect when something is better. Like stepping up from a nice pinot noir to a Burgundy, the wrapper here (and the filling for that matter) is memorable. 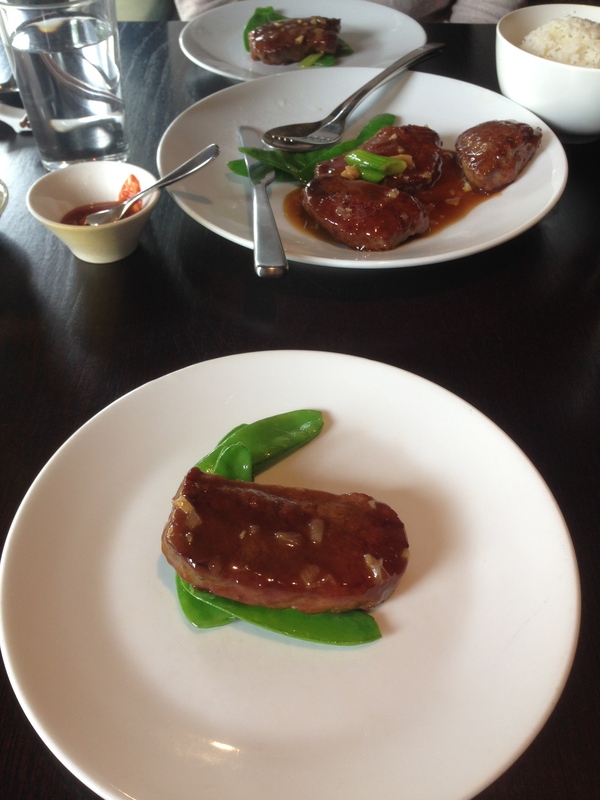 The second clearly higher quality aspect was the care in execution of the stir-fried fillet steak. In Western terms I think of stir-fry as a delicious jumble of several ingredients including at least one protein, in a soy / oyster based sauce, that is almost impossible to present elegantly. Here, you have simply and beautifully cooked fillet steak on the rare side of medium-rare, a deeply flavoured sauce with medium chunks of garlic and ginger dispersed, and some lightly touched baby snow peas. It is an eye opener when you realise that less is a lot more, and it feels like Chinese food suffers more than most with over-complication. We had decided to see if we could get in to Lau’s at 1.30pm on a Sunday and were pleasantly surprised they could fit us in at 2pm. I expect that we were lucky. While it is by no means cheap, for a light lunch with a couple of drinks it is certainly not expensive despite the fillet steak being $45. Besides, just like trying a fragrance when browsing at a department store, that drop of Flower Drum in our dishes was completely free. It looks the same. The atmosphere is the same. The food might actually be better in some areas. And that is the way institutions are supposed to be. To be exactly as they have lived in our memories for years and years. Luckily, the stories I have are from years ago. When, on those particular nights, the waitperson was charming and funny. The only lacking element tonight is the ability of the waitstaff to interact and add that X factor to the meal. Ten years ago (give or take), I was told about the “duck hangover” in detail and still relive that story to this day. Another time I was told to pull up the table cloth all the way up to the neck to protect from duck fat shooting everywhere. If you were at a Heston restaurant you would call it “theatre”. It is almost as if back then Heston named his restaurant accordingly after experiences at Old Kingdom. Tonight the duck is non-chalantly presented; politely enough, but without energy and enthusiasm. After grabbing a quick photo, our waitperson proceeds to begin cutting without any warning of duck fat splashing, and in close proximity to a vacant chair with one of our guests jacket hanging behind it. It seems there were no accidents, but the risks taken were exceptional! 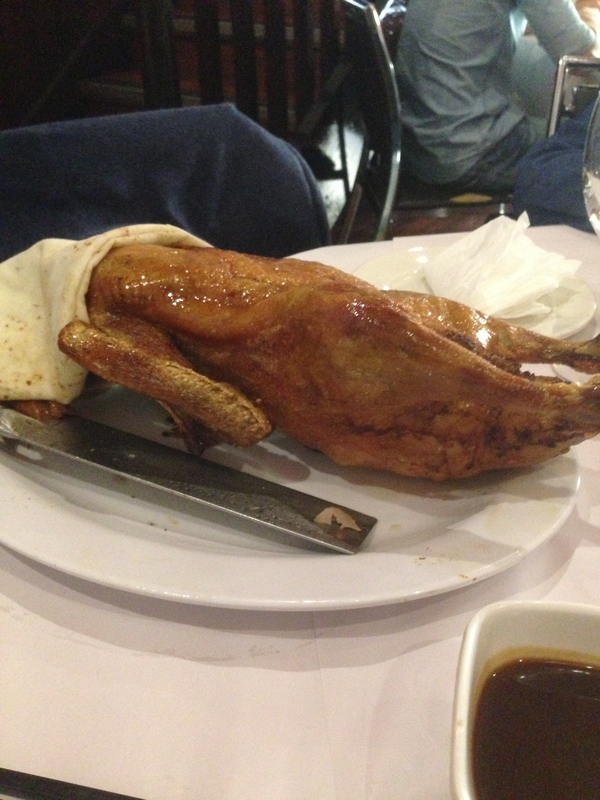 The duck itself is prepared expertly as you would hope for at a restaurant that specialises in Peking Duck. It is delicious, with a thin pancake, some spring onion, cucumber and hoisin sauce only adding to the experience. Addictive is probably the best description I can think of. 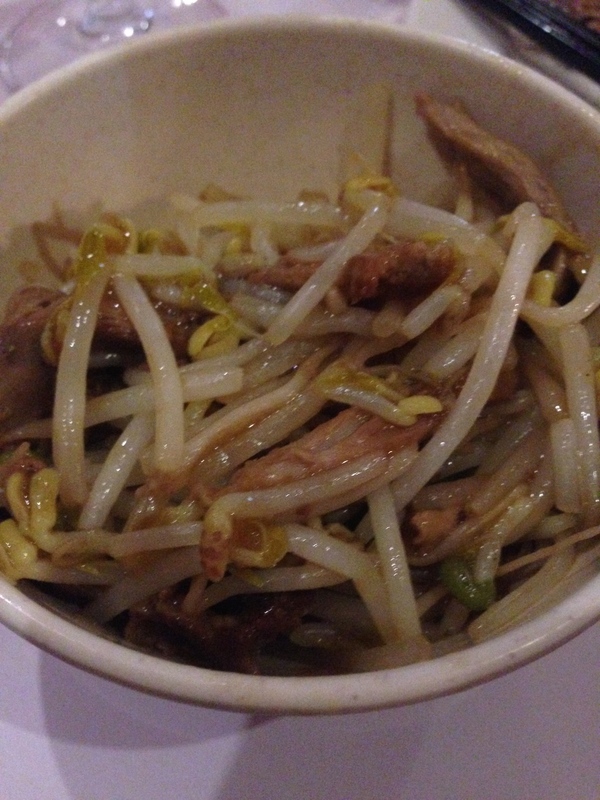 The duck stirfry (mainly bean shoots though) contains the leftover duck not chopped for the first course, but has some rich juicy pieces of duck meat. 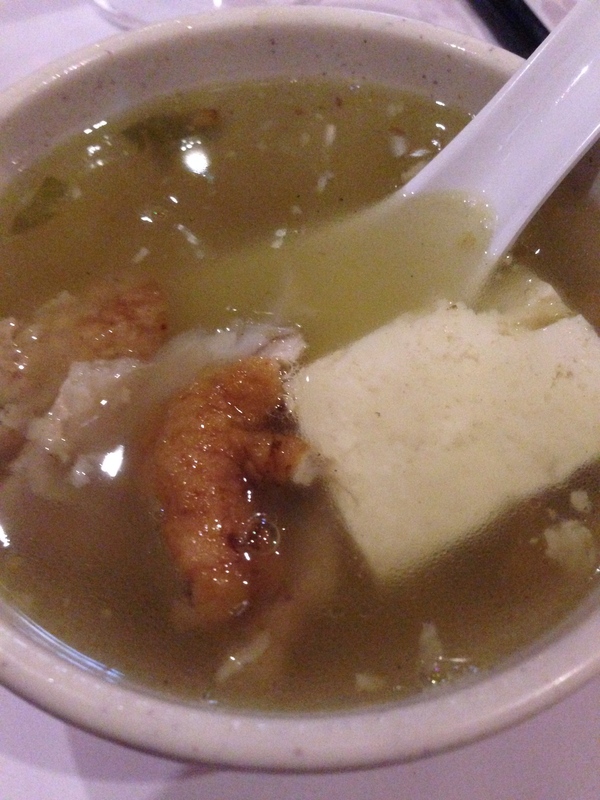 The last course, the duck soup, is deep in flavour, far better than my memory of this particular course. It is the first time I can think of trying seconds for this final edition of duck gluttony. As it stands, we had three ducks for five adults, which is probably over-indulgent. In fact, unlike other reviews, I decided to write this immediately following dinner given the forthcoming duck hangover, and serious duck regret I will probably feel tomorrow. Nothing exceptionally over-indulgent is without some form of come-down. 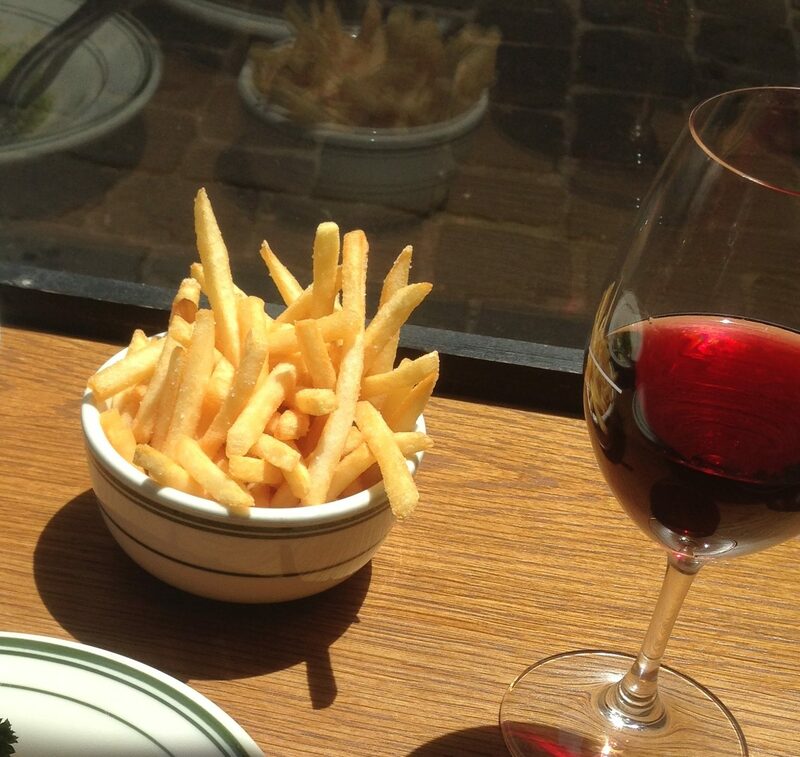 There are many special things about restaurants that stand the test of time. Think about the changes on Smith Street just in the past ten years. Old Kingdom has been watching all of the great improvements on this eclectic street while keeping its appeal. Roast chicken and Andrew McConnell. Anyone who belittles the virtues of chicken has not tasted perfect roast chicken. There was a time where chicken was plain Jane. Go to Marion and a half roast chicken is anything but that! The complication (besides salmonella) when cooking chicken is the fact that it is so often overcooked that we all believe it shouldn’t be soft and moist. We overcook it, bringing out extra salt in the skin, that compensates for some of the flavour lost as the chicken dries out. Then we cover it with any sauce to compensate, and have each mouthful with potatoes of some description. What is difficult to explain is why every time I eat chicken at one of McConnell’s restaurants, whether it be Cutler, or Luxembourg, or here at Marion, it is far better than the rest. Chicken, if nothing else, is certainly not new. It has been around. Why does it seem so complicated normally? I’m not a chef, and I haven’t done food science in a Heston type manner, so I won’t be answering any of my own questions here. All I know is that you can come to a wine bar on Gertrude Street that serves beautiful quality food, along with interesting wine, and a damn fine roast chicken. The space is comfortable in the way a crowded, people filled space can be when everyone is having a good time. Service keeps to that script with good ability and reasonable attentiveness. 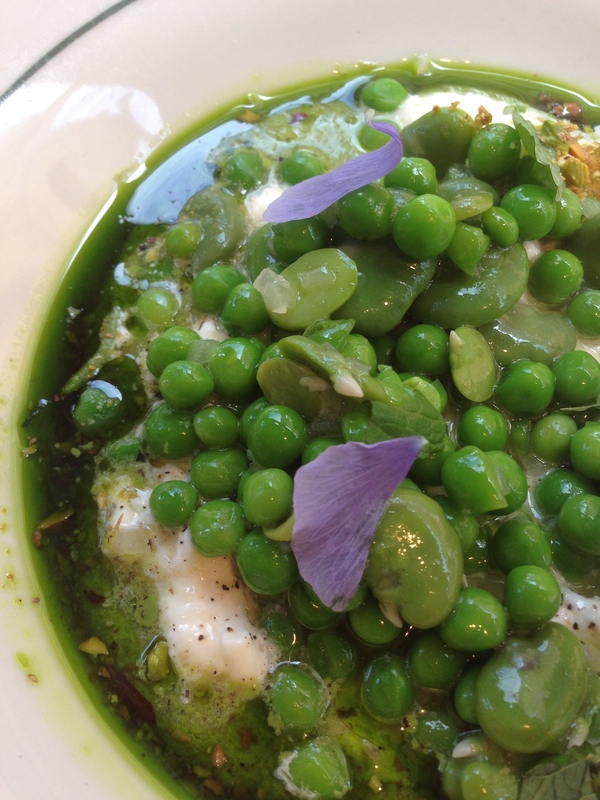 Even our starter of peas, broadbeans, scamorza cheese and pistachios is amazing, almost impossible to set aside to wait to eat with our chicken and chips. 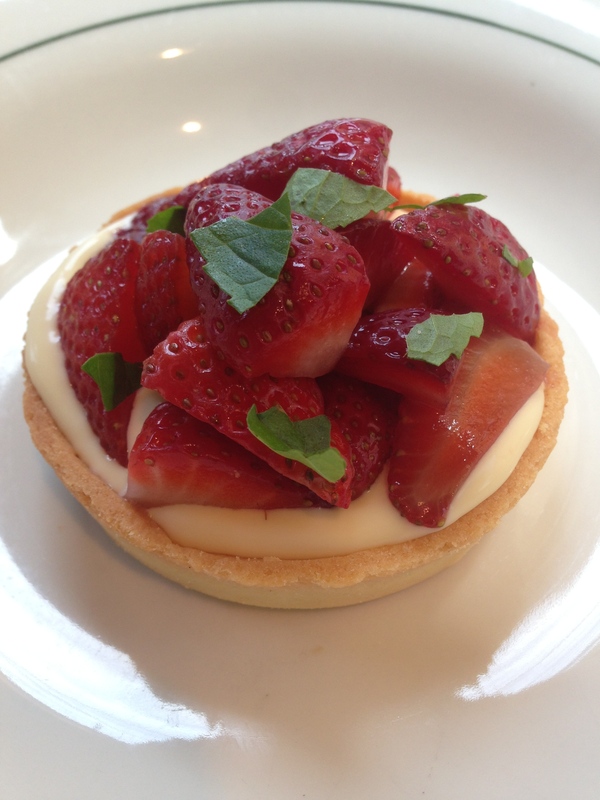 Unable to help ourselves, we also tucked into dessert in the form of lemon tart with strawberries and basil. The pastry was slightly sweetened to counteract the savoury quality of the basil with a balanced curd that had us reaching for more. Almost genius is the fact that we are sitting in a restaurant that is literally next door to Andrew’s flagship, Cutler and Co, which continues to thrive, but could be miles away for all we know. The two are as separate as if they were in different suburbs. That naturally makes dining in them completely different experiences, making dining in one today, and the other tomorrow, absolutely no issue whatsoever. It goes without saying that this is far more lucrative than merely creating another branch. While I think Marion might be close to genius, I am positive McConnell is pretty much there. Try the chicken.